PDF files are widely used in all kinds of fields because they are easy to view and edit. The PDF files even allow viewers to make signatures with no efforts. A PDF file looks just the way like it were printed, and the file can be shared among different readers to view and edit, so it is a convenient way for PDF readers to share ideas directly on the file. PDF files can be viewed on different devices, such as PCs, smartphones and tablets. For the users of iPhone, iPad or iPod touch, they need to install the PDF reader apps on their devices first, and then they can view the files. If the iPad users have installed iBooks on their iPad, they are able to buy books in iTunes Store, and then read the books with iBooks app on iPad. And if your have some PDF files stored on your personal computer, you be wondering how to sync them from PC to your iPad. Therefore, the post below will show you how to transfer PDF files to iPad. After transferring PDF to iPad, you can make use of iBooks app to read it anytime. 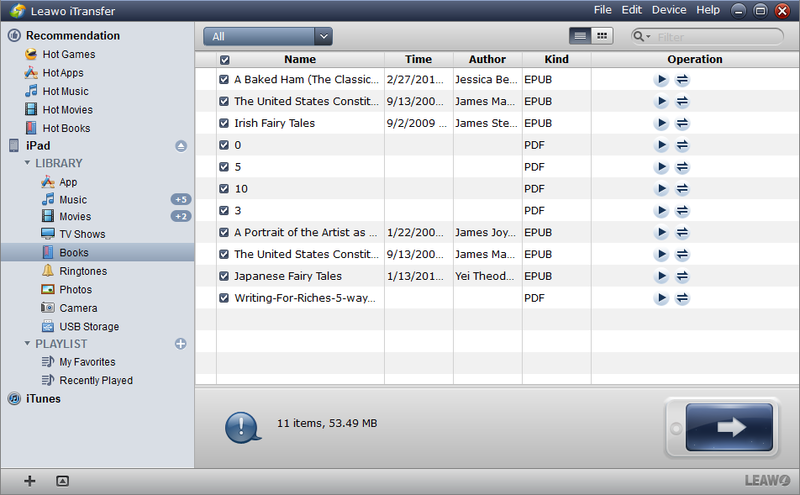 If users want to transfer PDF files to iPad with no sync of iTune, the third-party software is a good choice. FonePaw iOS Transfer, as a multifunctional iOS transfer tool, can transfer PDF to iPad without iTunes perfectly. This software is used for transferring files among iOS devices, iTunes and PC. You can also use it to backup PDF files on iPad to computer. It fully supports all iPad models, including iPad Pro, iPad Air 2, and iPad mini 4, iPad mini 3, iPad 2, etc. The following tutorial shows you how to transfer PDF files to iPad with the powerful iPad transfer software. Step 1. Download and install the FonePaw iOS Transfer on PC. Then, launch it and connect iPad to PC. When the device is recognized, you will see your iPhone on the main interface . All the catogories will be shown on the left sidebar. Step 2. Click “Books” library in the left column and you can see the books stored on your iPad. To sync PDF to iPad, click the triangle under the “Add” button and then select either “Add File” or “Add Folder”. After then, you can transfer PDF files to iPad. Tips: Please note that iTunes must be pre-installed on your computer for running FonePaw iOS Transfer before transferring PDF to iPad with FonePaw iOS Transfer. But you do not have to run iTunes during the process of transferring. 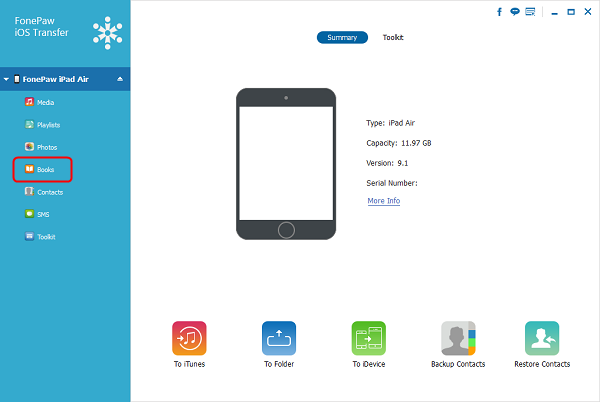 There is another iPad transfer software, Leawo iTransfer, is professional for users to sync PDF to iPad, which is used for transferring files among iOS devices, iTunes and PCs without the sync of iTunes. And it makes the transfer of iOS devices easy to be done. Various kinds of files like music, videos and apps can be transferred among iOS devices, iTunes and PC with the software. The following guidance will show you how to transfer PDF files to iPad, and you are allowed to free download Leawo iTransfer to have a try. Note that the trial version has limited transfer times. Step 1. Start Leawo iTransfer on your computer, and connect iPad to computer with the USB cable. The software will automatically detect the libraries of the iPad, and shows the libraries in the left sidebar. Step 2. 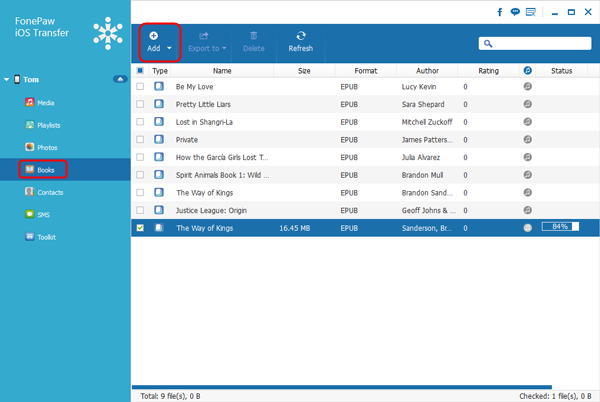 Click “Books” in the sidebar, and then the contents will be shown in the right part of the window. Click “File > Add > Add File/Add Folder” at the upper right corner of the window, and select the PDF files from computer. Step 3. The software will start the transfer immediately, and the progress bar in the pop-up dialog will notice the percentage of the transfer process. Leawo iTransfer will finish the transfer of the PDF files in seconds, when the transfer is done, you will get the PDF files in your iPad. If you are not using iBooks on iPad, you are still able to find various kinds of PDF reader apps in the App Store, and you can use the apps to read PDF files with no efforts. 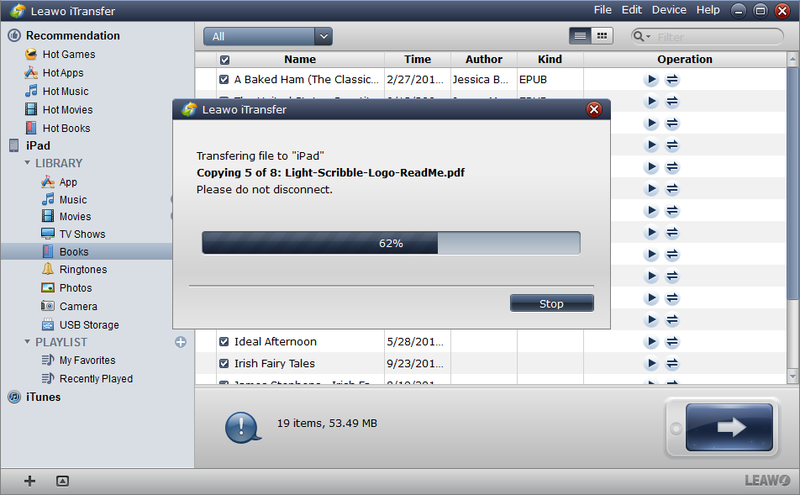 iTunes is another powerful program to transfer PDF files to iPad. Using it, you can transfer a collection of PDF file to iPhone at a time. 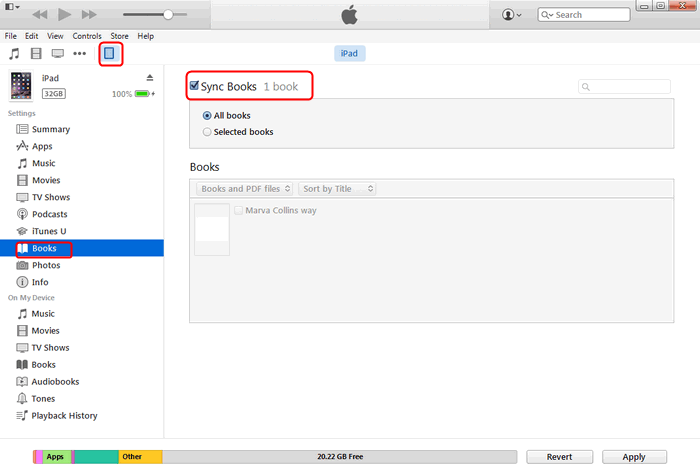 Follow the steps below to use iTunes to copy PDF files to iPhone. Run iTunes, and go to “Edit > Preferences > Devices > Prevent iPods, iPhones and iPads from syncing automatically”. Plug iPad into computer via the USB cable. The software will recognize your iPad and shows the icon of it at the upper right corner. Click “File > Add File to Library” at the upper left corner, and then select the PDF files from your computer. After adding the PDF files into library, you need to click the icon of your iPad, and choose “Books” in the summary panel. Then check “Sync from” and choose the PDF files in the window. iTunes will start syncing the PDF files into your iPad. After that, you will find the PDF files in the iBooks app on your iPad. 1. when syncing iPad with iTunes, users should make sure that the files in iPad are not got from other sources, which means iTunes always tries to erase the files that are not got from iTunes. 2. The PDF files transferred to iPad cannot be transferred back to computer, so users have to make backups of the PDF files. With the above three methods, you may have known how to transfer PDF to iPad. And the table will show you the comparison between the above methods: FonePaw iOS Transfer, Leawo iTransfer and iTunes, you can take it as a reference. Maybe there are other methods that could help you know how to transfer PDF to iPad. You can feel free to have a try.